Whether you’re looking to cut down on utility bills or help preserve the environment, green living has many benefits. Although you’re one person, how you act with respect to the environment can impact everyone around you. This lifestyle not only improves your day-to-day life but has positive effects on the entire community. No matter if you rent a UF student apartment, a downtown flat, or a suburban home, these conservation tips from Contemporary Management Concepts, LLLP will help you live green every day. Sustainability is about creating a balance between resource consumption and conservation; it’s the act of limiting yourself to a fair share of the earth’s resources while also giving back to the planet at each opportunity. Below, we list several green living practices residents can incorporate daily life at their apartments in Gainesville. Some student apartments in Gainesville include utilities. However, energy is the one utility practically all renters must pay, whether they’re in off campus student housing near UF or urban lofts in downtown. For financial reasons alone, it makes sense to limit your consumption of electricity. But there are also environmental considerations: though some Gainesville energy is generated through renewable means, namely solar and wind power, most electricity still comes from the burning of fossil fuels. Reduce your carbon footprint, and save some dough in the process, with these conservation methods. A trip to the supermarket can add more to your carbon footprint than previously thought. How the food is sourced, packaged, or transported to the market, as well as the method you use for carrying groceries, are all determining factors. Here, we list a few ways to shop greener. These are byproducts of livestock, which are responsible for nearly one-fifth of global greenhouse gas emissions. Local products, such as food and produce, aren’t transported from halfway across the world on emissions-producing vehicles. Instead, local markets, which aren’t too far from most apartments in Gainesville, include the Union Street Farmers Market, Haile Farmers Market, and Alachua County Farmers’ Market. These products are produced in ways that lessen the environmental impact. Look for labels such as Fair Trade Certified, USDA Organic, and Rainforest Alliance Certified on products, which can be found at local retailers like Whole Foods Market and Earth Origins Market. Plastic bags are not only manufactured with oil, a fossil fuel, but they’re also difficult to recycle and when littered can contribute to a sizable amount of ocean pollution. Whether you’re cleaning the apartment as part of weekly maintenance or as a final effort to satisfy the move-out requirements in the rental contract, cleaning products make a difference for the planet. Many off-the-shelf cleaners contain harsh chemicals, which are good for removing food particles from kitchen counters or soap buildup in bathtubs. Yet, when the dirty paper towels or rags are thrown away, or the excess cleaner is rinsed down the drain, those chemicals enter the environment and cause degradation. To limit the environmental impact of cleaning, use green products that are non-toxic and biodegradable. And if you’re left with no choice but to use toxic cleaners, be sure to properly dispose of all household hazardous waste. From food containers to scrap papers, and from broken electronics to worn-out clothes, waste is an inevitable byproduct of living. 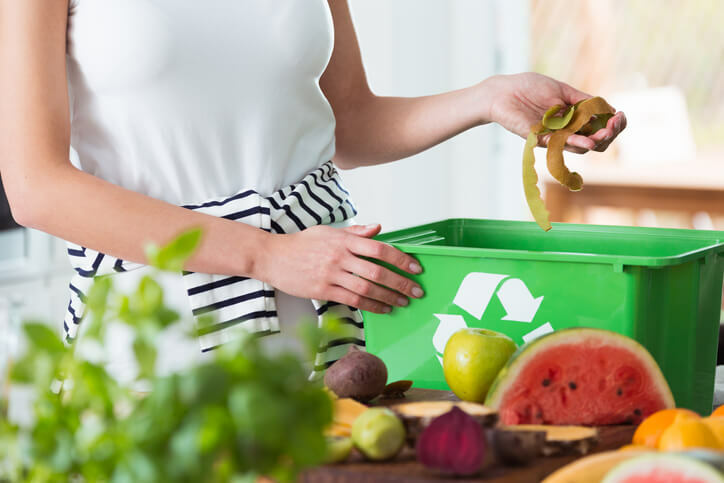 But here are two steps you can take to reduce waste, as well as efficiently process the waste you generate, to live greener. Take lunches to school or work in washable containers or even when moving between apartments or townhomes in Gainesville. One-time use containers generate a significant amount of plastic and paper waste that makes its way to landfills or worse to the ocean as litter. Separate trash from approved recyclable items and place each category of waste into the correct receptacle. It may be the community where you live has on-site recycling containers, but if not, you can find recycling drop off centers in Alachua County. Cars are a major source of pollution worldwide — internal combustion engines pump exhaust that contains carbon dioxide and other greenhouse gases into the atmosphere. That said, integrating the following means of eco-friendly transportation into your daily habits can have a positive effect on green living. Walk or bike to destinations that are located close to your neighborhood or apartment complex. Take the bus or drive a scooter to destinations further away, as these means of transportation have a lower amount of emissions per passenger than a personal car. Green living takes effort. You must be willing to follow sustainable practices regularly and not take shortcuts. That said, where you live can make a difference as to whether green living is easy or difficult. Contemporary Management Concepts, LLLP is one of the main property managers for student housing, apartments, townhomes, and houses for rent in Gainesville and across North Florida. We make it easy to find an apartment that encourages green living by featuring efficient appliances and on-site recycling, or that’s located within walking distance to the places you visit most. Contact us to learn more.